I don't feel like Spring happened this year. I just started to get my head around the fact that it was Springtime when bam - Summer - June 20. Part of it was the absolutely horrible weather that we had this Spring: rain, dreary days, clouds, raw temperatures, little sunshine if any at all. That doesn't make one feel very Springy. 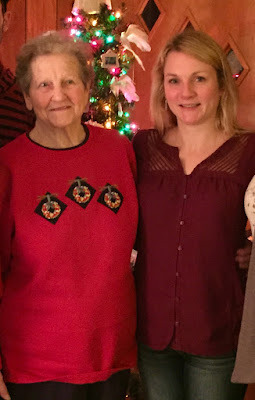 But for me, more than the doldrums of what would be our eternal Winter, it was the loss of my beloved grandmother, or my Mom-Mom as we called her. She died unexpectedly and suddenly on Saturday May 7, just a day before Mother's Day. She had suffered a stroke a couple of years ago, which really affected her health. But in the days before she died, she seemed OK -- pretty stable and pretty good and upbeat. She was 86. She loved more fiercely than anyone I've ever known. And she was loved by many. I spoke at her funeral. My sister and I did, as did my dad who read something that my mom had written. I have been to so many funerals where the officiant gives a stock speech about the person who died, and I couldn't bear to have that happen with her. It didn't at all. I felt that our three eulogies gave Mom-Mom's memory and legacy the respect they deserved. And while I am normally happy to [over]share with the internet things in my life, I'll have to beg you to forgive me for not sharing my speech here. It was my entire childhood and my grief and her and me and our family all wrapped up in 8 tear stained pages. But I can tell you that she was special. Grandmothers are special - they all are. I have said that to so many of my friends whose grandmothers pass away. And I am lucky because prior to May 7, both of my grandmothers were still alive. I never really allowed myself to think about a life without them because, well, I didn't know a life without them, and I couldn't imagine one. I'm still not sure I know what it's like. I spent every single Saturday night with my Mom-Mom from the time that I was an infant to the time I was in high school, when I stopped, opting to hang out with my friends instead. It, and she, was a constant in my life. I didn't realize how special this was until I was much older. Mom-Mom was there for every life event: every graduation, every ceremony, every religious milestone, every baby's birth. She would call me every single birthday. I still have a couple of her voicemails on my phone. She would call from time to time to check in. Or, despite the fact that I am a grown adult and a working professional, she'd sometimes send me some money in a card -- always cash (usually about $50) and always taped to the inside of a card: "I know it's not much..." she would say. It was always more than enough. As the years passed, her writing and her voice got a little shakier. I tried to ignore it until it was impossible to ignore. I remember having a conversation with my mom about her and about how we were aware that our time with her was limited. I certainly didn't feel that her death was imminent. But I knew it was happening sometime kind of soon. I just didn't expect it to be that soon. The kids and I were all set to visit her on that Saturday. We planned to stop by her house and give her cards and flowers and then head over to my parents' house for an early Mother's Day. The day before that visit, I was in the car heading to get my kids and had the urge to give her a call. I am still not 100% sure how to work my new car's phone, so I got to the "M"s in my phone book and was struggling with finding her number and canceled the effort. I will regret that forever. My friend Julia assures me that there was a reason I didn't make that call ... that God often directs us to do things that we might not understand. I am holding out faith that this is true. But I would give anything to have made that call and to have had the chance to say "I love you" and to hear it one last time. That was how every phone call, every visit, every card ended: "I love you, Shan." I can hear it now. I find myself thinking about her all the time and how she lived her life. She was stubborn, yet eminently forgiving. She was strong and independent, working until she was 85 years old and retiring only because of her health. In the end, she had the hardest time with allowing others to care for her: it was in her nature to care for others, not to receive that care. I realized on a run recently that two things that I love, and that have somewhat jokingly become sort of signatures for me, will forever link me to her: sparkles and unicorns. I'm a fan of sparkles. I love sparkly headbands for running. I know they're silly, but they make me happy and they make me smile. At Mom-Mom's funeral, the mother of one of my dearest friends came through and paid her respects. She had known Mom-Mom. She gave me a teary hug and said, "She sparkled. She was sparkly." I had never in my life heard anyone describe Mom-Mom like that but it was so perfect. She did sparkle: her eyes and her laugh and her warm smile. It was as though her heart was beaming through her entire face. So now whenever I don my sparkly headbands for a run, I will think of my sweet, sparkly Mom-Mom. And unicorns. I'll be honest that this was a shock to me as well. I love unicorns. I know it's partly silly, but as juvenile as this may sound, I kind of love their silly magic. I don't even like horses, but I do like the idea of a unicorn with its magical magic. Life needs a little magic and a little silliness. The day of her funeral, my mom asked the immediate family to come back to Mom-Mom's house and take a few things that we might want. That was really hard, but I am glad we did it. I had taken a handful of things that were very meaningful to me, when I stumbled upon this recessed wall shelf that she had. It had a bunch of random knickknacks and photos and tchotchkes but in the 40+ years of my life and in all of those 40+ years that I've been to her house, I never really looked closely at them. 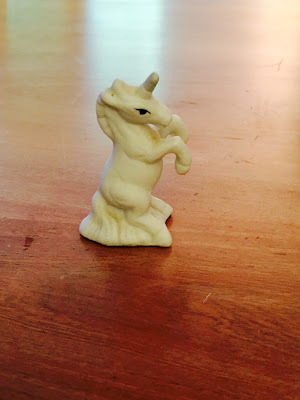 One of the little knickknacks was a unicorn. I took it with me. It reminds me that there is a little bit of magic right here with me. It makes me wonder what else about Mom-Mom I didn't know, and never will know, because I didn't ask or didn't think to ask. I find myself simultaneously longing to know the story behind this little ceramic unicorn and hanging onto the fact that I don't ... that there is, and always will be, some mystery to her life. I knew her and I knew her well, but there is so much that I didn't know. Proof that there is never, ever enough time. I miss her. I always will. Our family reunion is this weekend, and it is going forward, which is exactly what she would want. It will be painful and sad to not have her there, but I know I need only look at the smile and love surrounding me by my parents and sister and children and niece and cousins and aunts and uncles and know that really, she is there ... sparkling through our tears and our smiles. Hug your loved ones. Tell people you love them. Forgive. And if you are lucky enough to have your grandmother, give her a call today. Do it for me.